Mauricio Macri, President of Argentina, together with Michel Temer, President of Brazil, during a press conference in Buenos Aires in October 2016 at the beginning of their respective mandates. AP Photo/Natascha Pisarenko. All Rights Reserved. 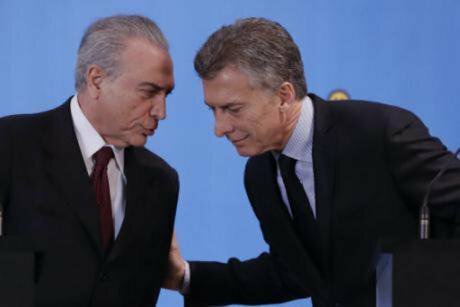 Ever since Mauricio Macri assumed the presidency on the 10th December 2015, he has radically modified the axes of Argentine politics. In only four months, the new administration imposed a free foreign exchange market (completely lifting the monthly limit for buying dollars), a strong deregulation of the financial sector (end of the 10% limit of holding foreign exchange assets in dollars for private banks), a monetarist turn from the Central Bank (that turned to de facto self-management, as an autonomous entity whose only objective is the stability of prices, through annual inflation goals) and the extremely costly payment of the vulture funds, a necessary condition to become indebted once more in the international financial market. The declared objective of the government was to obtain a “storm of investments” directly from overseas, driven by the renovated climate of corporate trust. However, the implemented reforms have revealed a resounding failure. The foreign investments have not only failed to arrive, but also domestic investments have collapsed due to the strong economic recession of 2016 and the successive fall of the industry sector, accelerated by the crisis in Brazil (main economic partner of Argentina). Is it possible that a government made up of CEOs and high-ranking officials of large international companies such as General Motors, Shell, JP Morgan, IBM, HSBC, Mondadori, LAN.. has been able to commit such a gross error? Such a failure was widely foreseeable reading any of the large international media outlets (The Wall Street Journal, The Economist, The Financial Times, etc.) that in the final months of 2015 repeatedly predicted an abrupt crash of foreign investments in emerging markets, particularly in Latin America, for 2016. However, what seems at first glance to be an excess of voluntarism and provincialism leads us to the real question: Is it possible that a government made up of CEOs and high-ranking officials of large international companies such as General Motors, Shell, JP Morgan, IBM, HSBC, Mondadori, LAN.. has been able to commit such a gross error? In other words, could Macri’s economic cabinet really be unaware of the climate of international business given its profound links to so many highly regarded multinationals? A negative response is possible if the measures taken in the first months by the Macri administration are seen as a preparatory phase for a strategy that, behind the façade of the “storm of investments”, pointed to a reality of profound restructuring of the Argentine economy and to its accelerated financialization. In the first stage, the most evident symptoms of this supposed objective were the massive issue of central bank bills (LEBACS – Letras del Banco Central) and the exorbitant growth of their annual rates of return. Such assets are the main tool for the controversial mechanism known as carry trade. Described simply, the procedure is the following: foreign investors enter the country with dollars and they put them towards central bank bills denominated in pesos. The bills are valued through very high interest rates (between 26,5% and 38% annually, in the last two years) and finally, the investor converts his initial capital once more, plus the financial gains, to dollars. Obviously, the carry trade mechanism has determined a very strong interest expense, involving an abundant supply of foreign currency reserve, in other words dollars, to pay creditors. To face up to this need, the Argentine government implemented the largest money laundering operation in recent capitalist history in 2017, equivalent to around 110 thousand million dollars. Furthermore, in the biennium 2016-2018 a sovereign debt denominated in dollars with a total of 76.032 millions of dollars was emitted, which has made Argentina the main sovereign debt issuer out of all emerging nations. This financial ferment has had important consequences for the property market, a phenomenon that is nothing new if we think of recent occurrences such as the growth of countries such as Spain through the financial-property bubble, previous to the crisis of 2008. In 2016, the total of mortgages rounded up to 4300 millions of dollars, reaching a record level of 7200 million in 2017. However, 42% of so called loans are represented by a new credit tool created by the Macri administration: Units of Purchasing Power (UPP) mortgage loans. These loans have a particular characteristic if we compare them to a traditional loan at a variable rate: the monthly payment is updated not only on the basis of interest rates (and therefore, exchange rates) but also on the basis of borrowed capital. In such a way, the first payments tend to be considerably lower in comparison to a traditional mortgage, which permits credit borrowers with lower incomes to access larger amounts, given the rule that imposes payments of no more than 25% of monthly income. Enthused at the thought of becoming owners of their own homes and attracted by the cheap payments (compared to the expensive rental payments), thousands of Argentines have decided to take out UPP mortgages to buy their dwellings. Despite the reduction in their incomes, many Argentines have benefitted from this access to credit as a tool for becoming the owners of their own homes or goods that are traditionally very expensive in Argentina such as cars and motorbikes. It does not end there, as the same type of credit has spread for the payment of cars, motorbikes, and even to cancel out pre-existing debt. As a consequence, the deeds of sale for properties rose 34.6% between November 2016 and November 2017. Additionally, the prices in dollars of M2 in Buenos Aires grew 17.6% in the period of 2015-17. The car and motorbike market reached a record level of growth of 25% and 17.6% respectively between January 2017 and January 2018. To put it in other words, by means of bold financial architecture, the Macri government managed to invigorate the financial, property and consumption of durable goods sectors, driving a growth of the GDP of 2.8% in 2017, despite the cuts that affected workers alongside productive sectors of the economy throughout the same period, particularly over salary understanding, the strong reduction in water, gas and light subsidies and the continuing rise of petrol prices. This unusual financial populism also explains the victory of officialism in the mid-term elections of October 2017: despite the reduction in their incomes, many Argentines have benefitted from this access to credit as a tool for becoming the owners of their own homes or goods that are traditionally very expensive in Argentina such as cars and motorbikes. However, for such financial populism to be successful (at least throughout the years), an economic scenario characterised by low inflation and a relatively stable exchange rate is necessary. Instead, given the high inflation rates of 2016 (40.3%) and 2017 (24.6%), the only way to maintain a stable exchange rate has been through the financial mechanism carry trade described above (in other words attracting a flow of speculative dollars through high interest rates) and through external debt. In this way, the government tried to rebalance the external deficit of the current account without a track record, equivalent to 4.6% of the GDP, through capital and the financial account. Nevertheless, two events have determined the end of this fragile equilibrium. On the one hand, on the 28th of December of 2017 the economic authorities, worried about the external deficit, announced a change in the objective for inflation rates for 2018, raising it by 5%. Likewise, the Central Bank began to reduce gradually the interest on central bank bills, arriving at 26.5% annually in March. Many corporate investors have interpreted these signs as the end of financial euphoria, gradually halting the renovation of central bank bills. Concerned about the pressures on the exchange rate, the Central Bank has begun selling reserves, reaching a worrying sum of 6800 million dollars so far this year. On the other hand, the appreciation of the dollar in a global context and the rise in interest rates on the part of the Federal Reserve have motivated many institutional investors to abandon the Argentine market to displace themselves towards the markets of the Northern hemisphere, above all when the United States bond at the 10 year mark, the safe haven asset par excellence, has been already situated at 3%. On Thursday the 4th of May both factors came together, provoking a perfect storm over the Argentine economy: the exchange rate increased to 23.5 pesos and the Central Bank had to increase the basic interest rate to 40%, introducing restrictions for the tenure of dollars for private banks. The Finance Ministry announced stricter fiscal goals, in other words, an imminent and predictably brutal adjustment. Alarmed by the risk of a terminal crisis and one week before a crucial auction of LEBACS that has been announced as extremely risky, on the 8th of May president Macri has finally declared on national television his formal request for a loan from the IMF. Despite this, the situation has not stabilized. There is no need to underestimate the effect that this sudden devaluation of the peso will have on UPP credits. on the 26th of March 2018, the value of UPP payments was already equal to that of traditional mortgages and the future is barely encouraging in terms of payment capacity. If we additionally consider the recent introduction on the part of the Central Bank of a rule that authorises banks to get rid of mortgages, selling them on the financial market, we see various worrying parallels with the US financial crisis of 2008. Alarmed by the risk of a terminal crisis and one week before a crucial auction of LEBACS that has been announced as extremely risky, on the 8th of May president Macri has finally declared on national television his formal request for a loan from the IMF. Will he achieve this to stop the next financial bubble bursting in the Rio de la Plata after the Lehman Brothers?